Marshals & Myrmidons is a role-playing game made for a small group of two persons or more. It has been played by many groups of people over the last 30 years and has been refined and polished into a fun and easy to use game. The biggest difference between Marshals & Myrmidons and other role-playing games is our adventure wheel system. It allows us to do everything from generate characters to random encounters, and even replace the use of dice. Included with the game is a searchable and hyper-linked biographies, gazetteers, and maps of the people and places in the Marshals & Myrmidons universe. Our free demo includes almost 400 articles and the full game includes several times that much. The map system allows for near unlimited user-created map sizes by breaking down large maps into tiles and zoom levels. Easily allow for a planet-wide map that can be zoomed all the way down to a city level. The city level zoom can also be done as a linked map that has it’s own zoom levels. 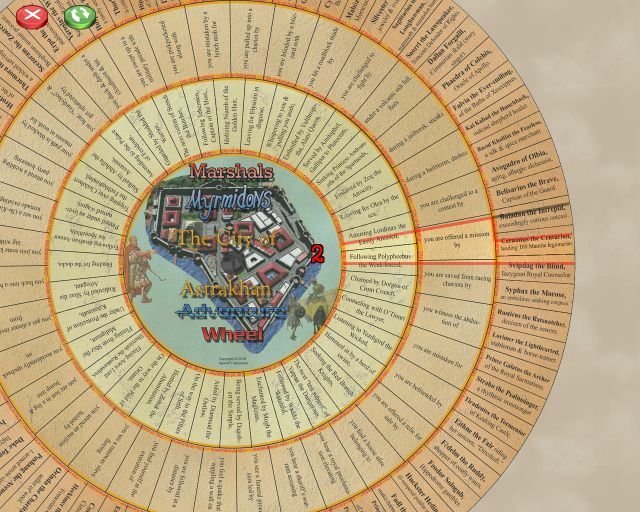 The built-in markers allow the GM and players to keep track of where everyone is and any significant details on the map. Markers can be assigned custom names that make keeping track of everything easy. Each map has a built in scale and measuring tool to easily determine distances. 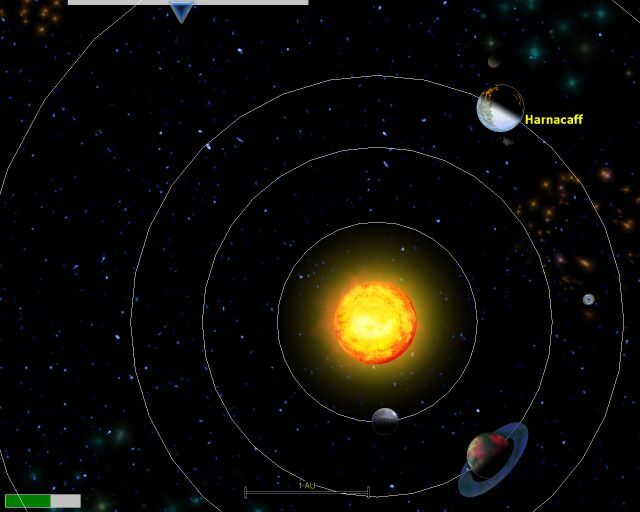 The built-in solar system tool allows for easy dynamic creation of an inner solar system. The planets orbit their sun or suns and can have moons as well. Each planet and sun can be assigned data points that describe the planet’s class, size, gravity, technology level and population. The day and year length are calculated based on parameters set in the editor. The suns can be assigned a type and luminosity / size class as well, as diameter, temperature, and gravity. All parameters are optional, and are there to enhance game play. The planets and suns can be linked directly to their manual entry and a map of the surface. The editor can quickly generate a new system that is fully populated as a starting point for adding your own content. The HTML manual is simply HTML pages that are named for each topic in the game. 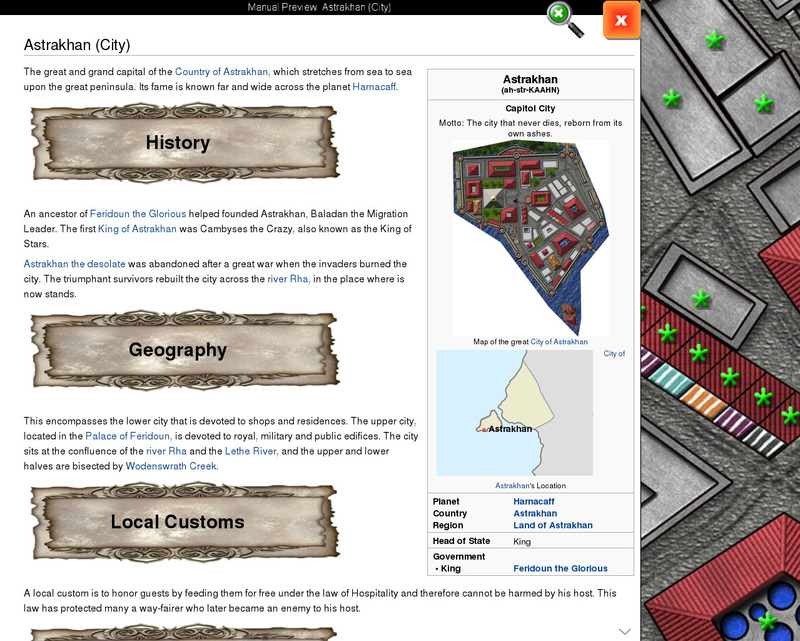 It can be displayed at any time to share information with players or for the game master to look up details. When designing your own game in the framework instead of using local HTML files, the framework can be redirect to a website of your choosing, like a wiki. 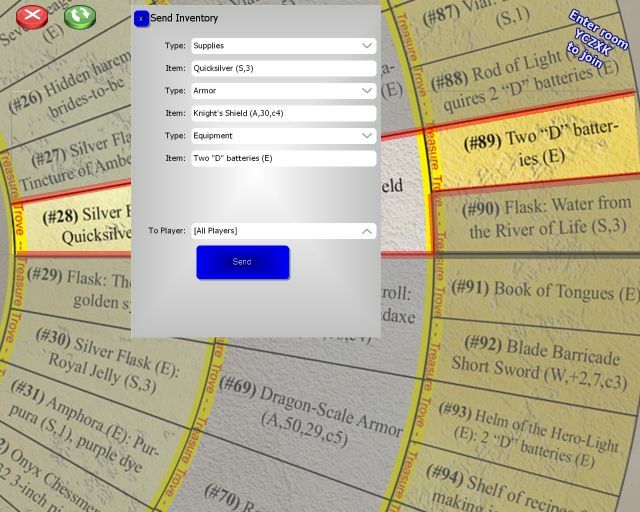 Lookup tables can be replaced by the Adventure Wheel system. Each wheel has 36 entries separated into 3 rings that will spin a randomized pairing. The wheels can be fully customized to include anything. Inventory items can be assocated with each entry to allow sending to players quickly. Each time the wheels are spun a record of it is made by the game. This can make it easy to go back and review the results and end arguments about what was spun earlier. This history can also be saved out to a file. It is also sent to the connected clients as the wheels are spun. The history can also be used to open the associated manual entries from the wheel entry. 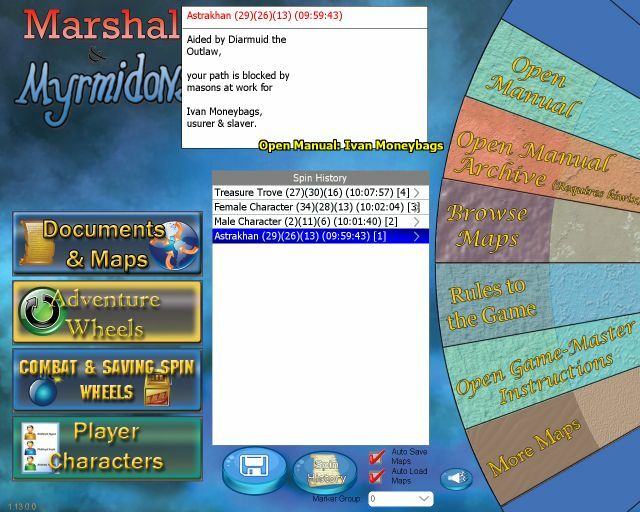 A subset of the Adventure Wheel system is the character generation wheels specific to Marshals and Myrmidons. A new character can be spun in less that 15 seconds, and with multiple options to generate the player’s character sheet. The game can send the character to our on-line tool that will generate a printable PDF file for the character with everything pre-filled in. Or, if using the Character Exposition app, a quick code can be entered or sent by the game to pre-load the character into the app. Or the details can be copied by hand onto a printed Character Exposition sheet. From time to time, non-player characters need to be created by the game master. While some might find this an easy task, it isn’t for everyone. This tool quickly generates a unique NPC with parameters to control where the NPC is from, what gender, race, and profession classes the NPC comes from. There is also control over their spouse’s gender and name. 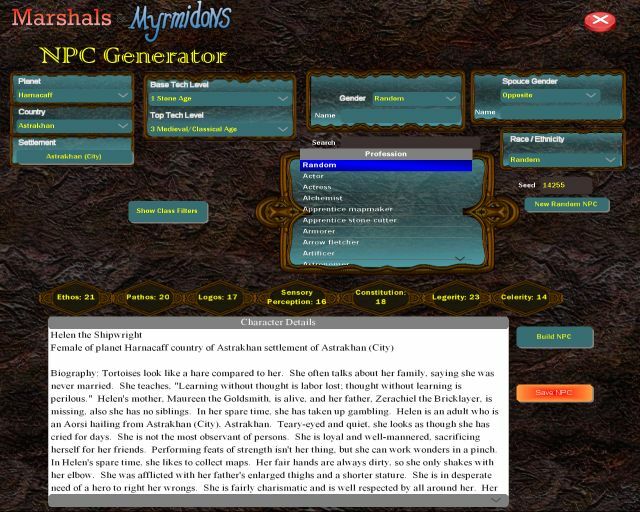 Nearly every aspect of the generator can be customized, including the 7 generated stat names and ranges. Finally the generated NPC can be exported to an HTML file for later reference or to be printed. The group building tool is used to create a realistic group of NPC or animals. 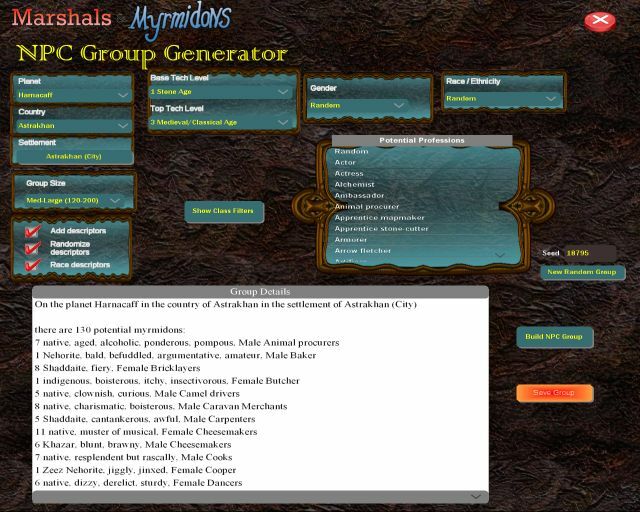 The framework includes a system that utilizes multiple parameters to generate a seemingly realistic groups. 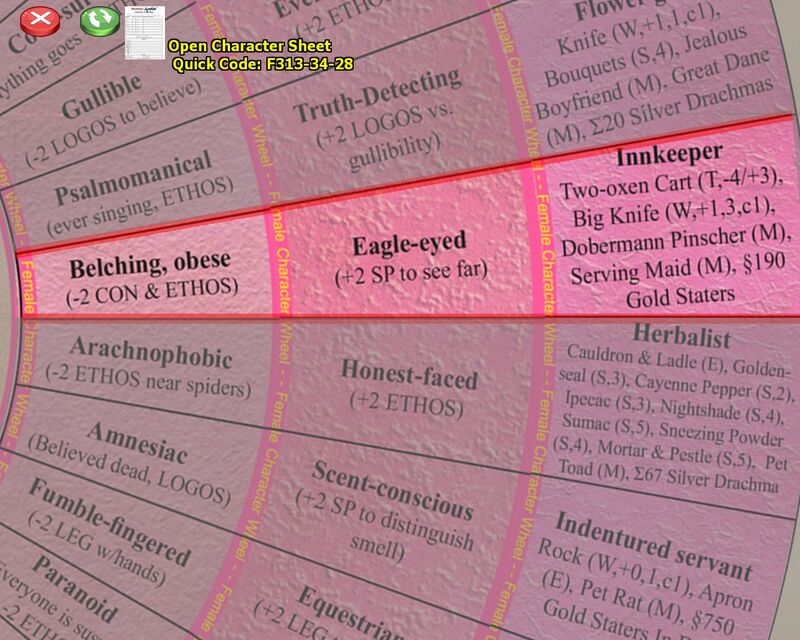 Each type of entry has factors that affect it’s rarity and the size of a typical group, so that for instance a group of NPC might only have 1 king or maybe 1 spy but a bunch of soldiers or peasants. The same holds true for the animals. Each NPC can be filtered by technology levels or different classifications like royalty. Animals can be filtered by the environments and climates. 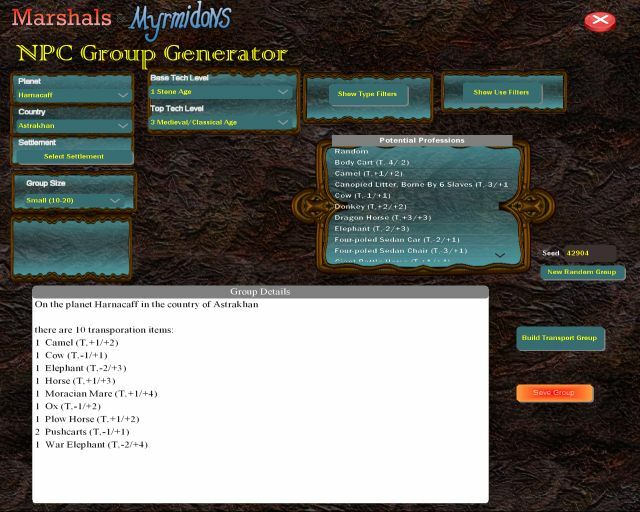 The group building tool can also be used to create a realistic group of modes of transportation. 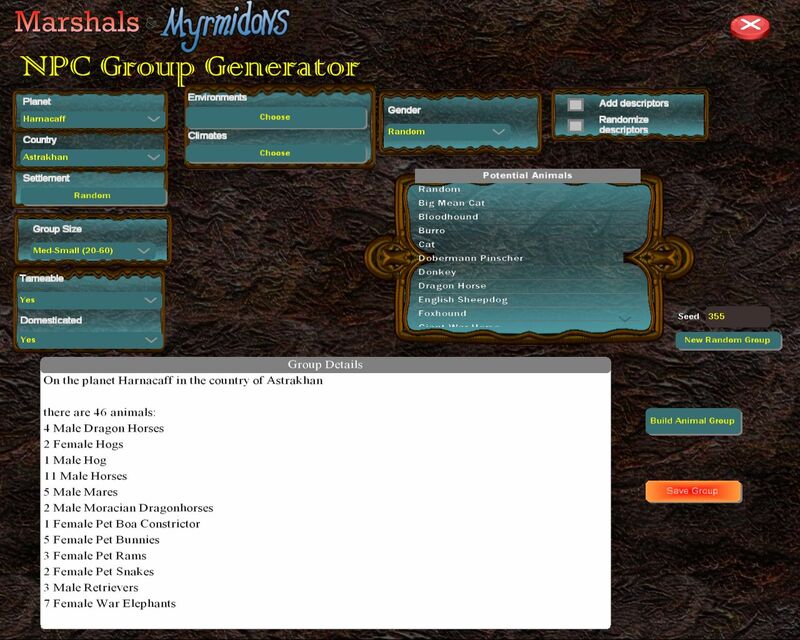 The framework includes a system that utilizes multiple parameters to generate a seemingly realistic group. Each type of entry has factors that affect it’s rarity and the size of a typical group. The modes of transportation can be filtered by their uses and technology levels. The system can create a game room that others running the Character Exposition app can join. When they join the room they can send text messages to the game or to other players. Any wheel spins are automatically sent to the clients. When a new character is spun, the code to automatically add it to the client is sent to be used at any time. Inventory items can be sent back and forth to any client, and if a wheel has items that might go into the inventory, they will be automatically added to the interface so they can be sent by the GM. The app is designed to speed game play and not get in the way. Allows up to 10 characters to explore a procedurally generated map. Includes a limited view radius so players can’t see the whole map. Can also fill in the fog as they move only allowing the immediate area to be visible. Removes player knowlege of the whole map so they are forced to discover it with their character. Button puzzles can be included to set traps or control doors, or anything else. 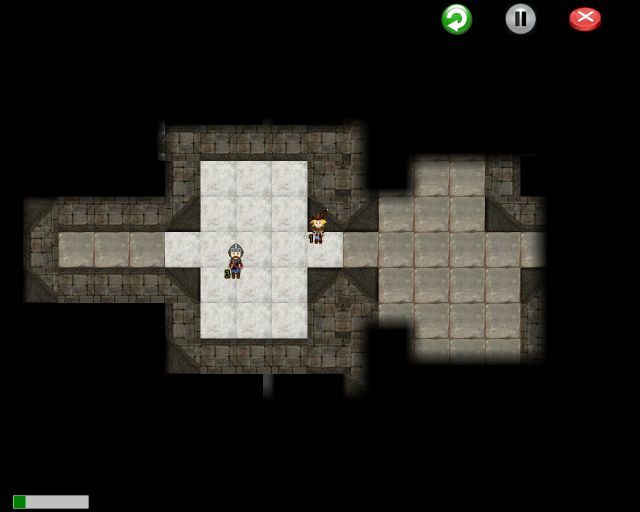 Included are tools to generate dungeons quickly and populate them with anything. The free form button puzzles that can be used to simulate traps, or consoles/panels, or any other type of interaction of that nature. 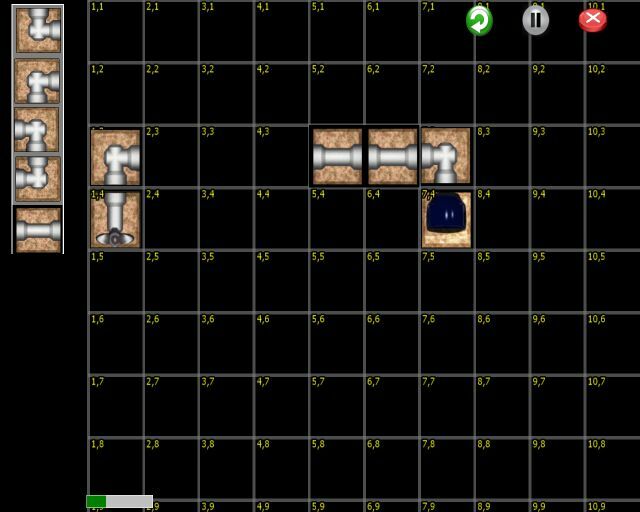 The “pipe” style games similar to Pipe Dream where a series of tiles have to be aligned without leaks to connect points on the map. They are not limited to just that, the tools from the button puzzles can be included to increase the interactions. Random queue mode where a never ending queue of randomly generated pieces are given to solve the puzzle. Rotation mode where all the pieces are placed and must be correctly rotated. 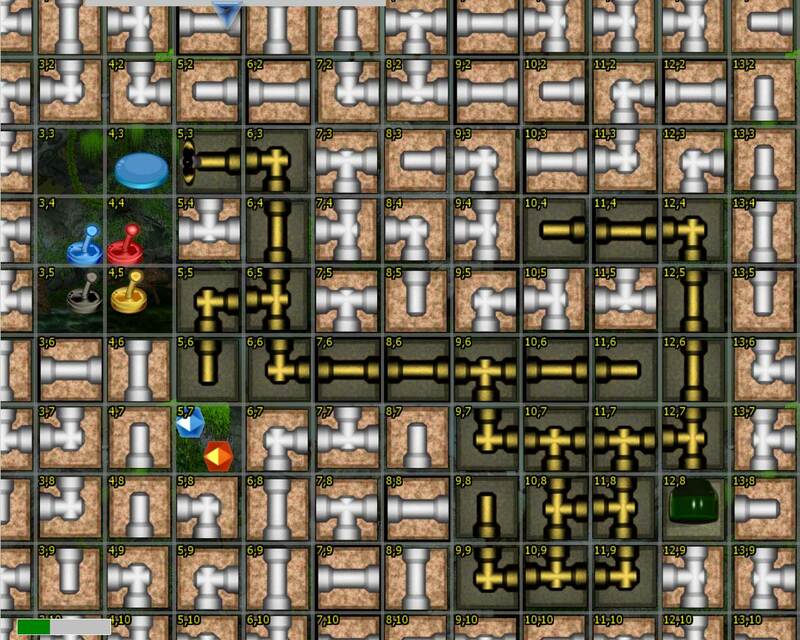 Swap mode where each tile clicked with swap with the tile in the queue. Inventory puzzle where a predetermined inventory of pieces are given to solve the puzzle. All the mini-games can be extended with custom graphics and sounds to accommodate any look and feel required by the situation. They can also be linked to other mini-games, maps, or wheels to increase the immersion. 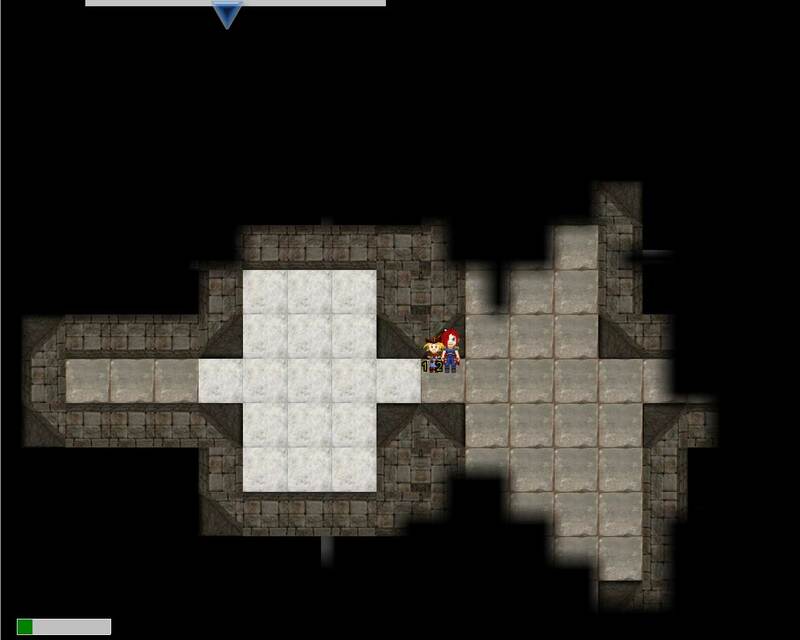 The results of one mini-game can be passed to affect another mini-game, like solve a puzzle will open a door in the dungeon. Map items related to the current objective show an icon indicating it is an objective. Mission objectives can be linked to wheels, map locations, mini-games. Linked map items can open directly to the map and highlight the specific point of interest. Update for Windows version and Downloadable Manuals. Thanks to some feedback on some of the content in the manual, we have revised a few area and there are a few small additions. The new Windows version is 1.8.7.1. The Android version is not changed because it does not have the packaged manual. Both zim files have been updated as well. This is primarily a bug fix. There was some issues with dialogs and images that this fixes.